2009-04-08. New. Ships with Tracking Number! INTERNATIONAL WORLDWIDE Shipping available. Buy with confidence, excellent customer service! 2009-08-02. Good. Ships with Tracking Number! INTERNATIONAL WORLDWIDE Shipping available. May not contain Access Codes or Supplements. May be ex-library. Shipping & Handling by region. Buy with confidence, excellent customer service! U.S.A.: Hendrickson Publishers, 1994. (USA) 3rd printing. Owner's name and short inscription on the back of cover to each volume, slight bumping of lower corner tips on a three volumes, otherwise about Fine; no dust jacket as published. Burgundy leatherette with gold titles. 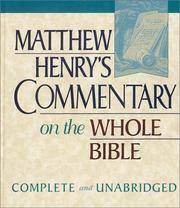 I: Genesis to Deuteronomy, ciii, 693pp, Includes a life of Matthew Henry. II: Joshua to Esther, ix, 891pp. III: Job to Son of Solomon,x, 906pp; IV: Isaiah to Malachi, xiii, 1187pp; V; Matthew to John, xi, 1000pp; VI: Acts to revelation, ix, 956pp. Henry (d 1714) was a Welsh non-conformist minister, best known now for this verse by verse commentary on the Bible which was published after his death as a complete work in 1811. It was considered sensible and stylish, and Protestant ministers highlky recommended it. George Whitefield read it four times, the last time on his knees. A very heavy set. (15.0 JM FO 54/2. Hardcover. Near Fine/No Jacket. 8vo - over 7¾" - 9¾". 2017-12-21. New. Ships with Tracking Number! INTERNATIONAL WORLDWIDE Shipping available. Buy with confidence, excellent customer service! Hendrickson Publishers, Inc.. Hardcover. 1598564366 Special order direct from the distributor . New. Fleming H. Revell Company. Hardcover. B002J04TEW Very Good Condition. Five star seller - Buy with confidence! . Very Good. New York: Fleming H. Revell Company, 1935. First Edition. Near fine copies in the original publisher's gilt-blocked and blind-bordered cloth, edges very slightly toned. Corners sharp with an overall tight, bright and clean impression.. Physical description; four volumes. Contents; Volumes I: Genesis to Deuteronomy. Vol. II: Joshua to Esther. Vol. III: Job to Song of Solomon. Vol. IV: Isaiah to Malachi. Subjects; Matthew Henry (1162-1714). The Bible. Commentary. Practical Notes. Biblical Exegesis. Hendrickson Publishers. Hardcover. 1598564358 Like New Condition. . Fine. Hendrickson Publishers. Hardcover. 1598564358 New Condition. . New. Hendrickson Publishers, 1991-09-01. 2nd. Hardcover. Used:Good. 2017-12-21. Good. Ships with Tracking Number! INTERNATIONAL WORLDWIDE Shipping available. May not contain Access Codes or Supplements. May be ex-library. Shipping & Handling by region. Buy with confidence, excellent customer service! Hendrickson Pub, 1991-03-01. 6 vols. Hardcover. Used:Good. Hendrickson Publishers. Hardcover. B001EETXO0 Good Condition. Has some crinkling. Five star seller - Buy with confidence! . Good. Hendrickson Pub, 2009-06-09. Hardcover. Good. Thomas Nelson, 1997-10-15. Hardcover. Used:Good. Hendrickson Publishers, Inc. Used - Like New. Like New condition. 6 Volume Set. Published in 2011. NOT AVAILABLE FOR SHIPMENT OUTSIDE OF THE UNITED STATES. Hendrickson Pub, 2009-06-09. Hardcover. Used:Good. Hendrickson Publishers, 1991-03-01. Hardcover. New. 6 volume set. Hardcover. Good binding and cover. Clean, unmarked pages. 25 cmContents: Vol. 1: Genesis to Deuteronomy --Vol. 2: Joshua to Esther --Vol. 3: Job to Song of Solomon --Vol. 4: Isaiah to Malachi --Vol. 5: Matthew to John --Vol. 6: Acts to Revelation. This is an oversized or heavy book, which requires additional postage for international delivery outside the US. 1991-07-05. Good. Ships with Tracking Number! INTERNATIONAL WORLDWIDE Shipping available. May not contain Access Codes or Supplements. May be ex-library. Shipping & Handling by region. Buy with confidence, excellent customer service! 1997-10-15. Good. Ships with Tracking Number! INTERNATIONAL WORLDWIDE Shipping available. May not contain Access Codes or Supplements. May be ex-library. Shipping & Handling by region. Buy with confidence, excellent customer service! Hendrickson Publishers, Inc, 2009-06-09. Hardcover. New. Brand New. Multiple copies are available. Hendrickson Publishers, Inc, 2009-06-09. Hardcover. Like New. New and unread publisher overstock. Multiple copies are available. 19910803. Good. Ships with Tracking Number! INTERNATIONAL WORLDWIDE Shipping available. May not contain Access Codes or Supplements. May be ex-library. Shipping & Handling by region. Buy with confidence, excellent customer service! Maclean, Virginia, USA: MacDonald Publishing Company, 1985. . 888 + 1153 + 1101 + 1506 + 1238 + 1188 pages, complete and unabridged. This copy undated. Page edges a little browned and foxed, a little bumping to extremities, slight tear to one external hinge, but overall a very serviceable reprint of the common Victorian Nisbet edition. . Hard Cover. Good Plus. Hendrickson Publishers. Hardcover. 1598564358 Ships promptly from Texas. . New. 2009. Hendrickson Publishers. Hardcover. 1598564358 Ships from Tennessee, usually the same or next day. . New. 2009. Hendrickson Pub. Hardcover. 094357532X . Very Good. Hendrickson Publishers, Inc.. Hardcover. 1598564366 No International Shipping, 6 book set . Good. Hendrickson Publishers, 2009-06-16. Hardcover. Good. n.p. : Hendrickson Publishers, Inc, 1994. Reprinted. Hardcover. Octavo; VG-/no-DJ; burgundy spine with gilt text; 6 volumes: vol. 1, Genesis to Deuteronomy, pp 693; vol. 2, Joshua to Esther, pp 891; vol. 3, Job to Song of Solomon, pp 906; vol. 4, Isaiah to Malachi, pp 1187; vol. 5, Matthew to John, pp 1000; vol. 6, Acts to Revelation, pp 956; cloths have slight wear to exteriors; lightly bumped corners; strong boards; text blocks show light wear to exterior edges; interiors clean; frontispieces; profusely illustrated; volumes housed in box with tape mends and noticeable wear to exterior, as is; additional shipping may be necessary due to size/weight restrictions for international/expedited orders. FP New Rockville Stock. Hendrickson Publishers. Hardcover. 156563778X New Condition. . New. Hendrickson Publishers, 2008-08-01. Unabridged. Hardcover. Used:Good. Edition: Later prt of 1st edition. Hendrickson Publishers. Hardcover. 156563778X Like New Condition. . Fine. Hendrickson Pub. Hardcover. 1598562754 Special order direct from the distributor . New. London: endrickson Publishers. Hardcover. 0551050101 pp xi, 784 . Fine. 1960. 1st Thus. Hendrickson Publishers, 2005-01-01. Hardcover. Good. Hendrickson Pub. Hardcover. 094357532X . Fine. Hendrickson Pub, 2008-08-31. Una Rep Ne. Hardcover. Used:Good. Hendrickson Publishers, 2008-08-01. Hardcover. Used:Good. In Stock. Always but with confidence. US: Hendrickson Pub, 1991. Hendrickson Pub 1991 8th Printing Fine/ Printed July 2000. Bright pages. 2485 pages. Small print. Pages 9-12 have passages underlined in red pen. VERY LARGE VERY HEAVY ITEM. Size: 9 1/2 x 8 1/4 x 2 3/4 inches.. 8th Printing. Hardcover. Fine. No Exp.